I was born in Alberta, Canada, and my parents and brother immigrated from Denmark in the the early 50’s. I have lived in So. Cal. since I was 4, and practically grew up on my dad’s fishing boat. It was just a 24′ wooden Danish cabin cruiser with a Volvo inboard – and I loved it! Many fun times were had out at Catalina and also Anacapa and Santa Cruz Islands. I had no fear out in the big blue ocean, even fishing in 10-foot swells because I had my dad with me…in fact that was the time out of San Pedro when I caught a pretty large salmon maybe two feet long! I remember my parents threw a party (which Danes like to do) and it fed everyone! Of course, deep-sea fishing- we caught a lot of rockcod. Red Snapper is still my favorite. 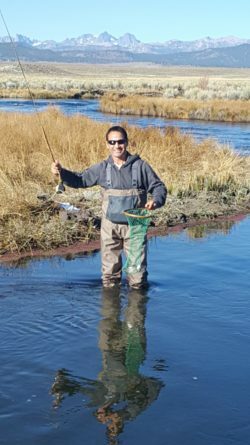 These days I hope to catch my own trout– which I know will happen this year with the Conejo Valley fly fishers. Well, I think my love for fishing, adventure and the outdoors all started on the ocean with my dad, and I have passed that down to my kids. I have two kids, and they were each sometimes dragged along on my travels, whether it was sailing on my boat to Santa Cruz Island, camping and exploring the Pacific Northwest or travelling through Europe. They are 20 and 33 now, and have become two amazing adults- and both quite adventurous too. My son, Brian, has already travelled the world, and now works in the solar field. My daughter, Hanna, is finishing up her 3rd year at Humboldt State majoring in environmental engineering and chemistry and just got sworn into the Coast Guard. 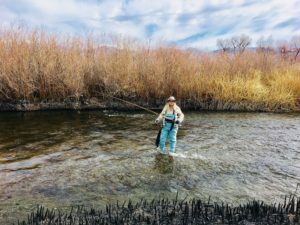 I live within walking distance of our club’s meeting location, and after my second meeting I had my first real fly-fishing adventure with Cece, Charley and others to Bishop. I had the most amazing time, and hopefully this is the beginning of a future in fly fishing for me. 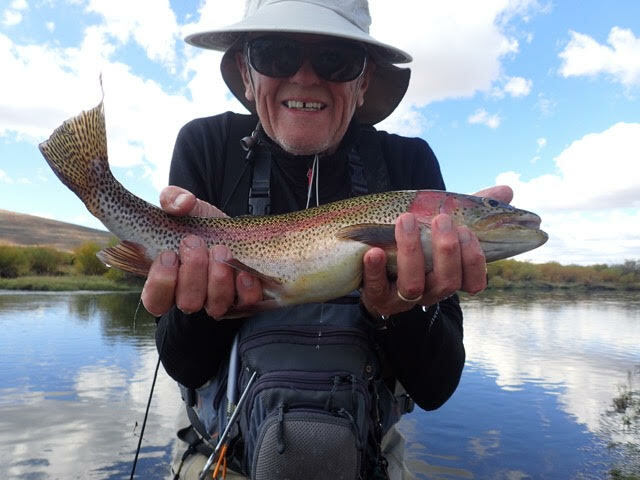 I have been a fly fisherman for over 65 years, mostly in Colorado where I lived for 50 years having moved to Camarillo 2 years ago. I owned a fly fishing specialty store, The Flyfisher Ltd in Denver for 23 years. I was also a sales rep for the Orvis Company for 4 western states. 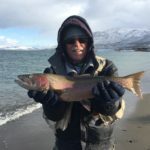 I have fly fished in most of the cold water fishing states including Alaska as well as Canada, New Zealand, England, Sweden,Mexico and Belize. 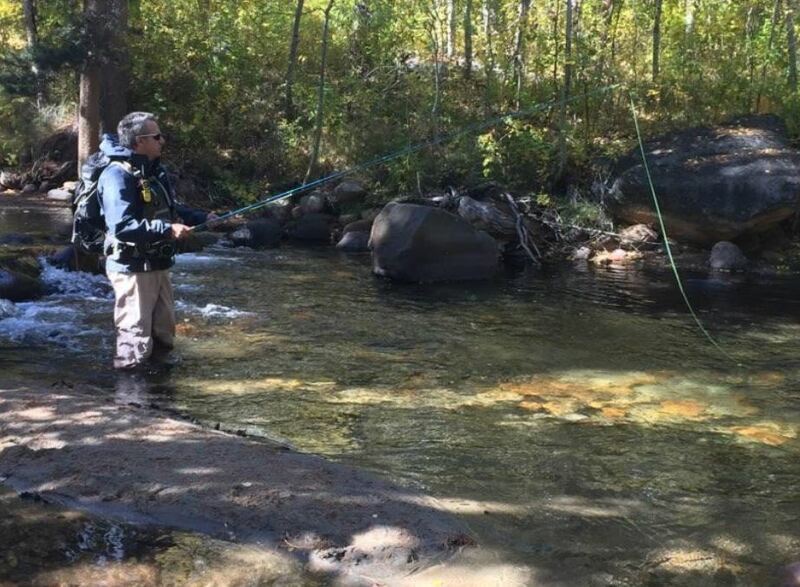 I have been fly fishing for about 12 years now, and still learn many new things each time I go. I live in the West Hills area of the San Fernando Valley with my wife Carolynn. We have four grown children, Kelly, Jackie, Courtney, and Jeff, and have been blessed with three grandchildren and two more on the way in the next few months. My favorite area to fish is Bishop / Mammoth area primarily the Owens River (upper, middle, or lower) I enjoy fishing them all. Two years ago I picked up a fishing kayak, and enjoy summer outings at Rock Creek Lake, Gull Lake, pretty much any place in the Sierras’ with water and fish. One of my recent fishing memories was late this summer I had been kayak / fishing at Rock Creek Lake. As I came up on the shore a little boy approached me and asked me if I had caught anything, which I said yes but I had let the go. He replied “why would you do that”, and my response was “so you could catch them”. The big grin on his father’s face said it all. I plan on retiring in a couple of years, and would like to plan some trips to Montana, Utah, and Wyoming. I am looking forward to meeting you in the coming months. Richard and Regina O’Neill are a couple who love to fly fish together. 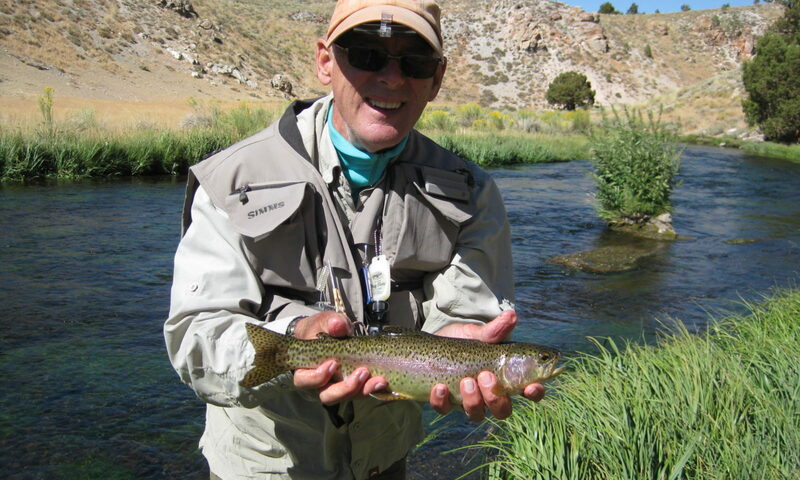 Richard began fly fishing when nine years old at a cattle ranch in the California Feather River country. Regina got hooked on fly fishing early on in their marriage while on a trip to Colorado. Their daughter and son were very little when Richard made them their own fly rods, taught them how to tie flies and fly fish. 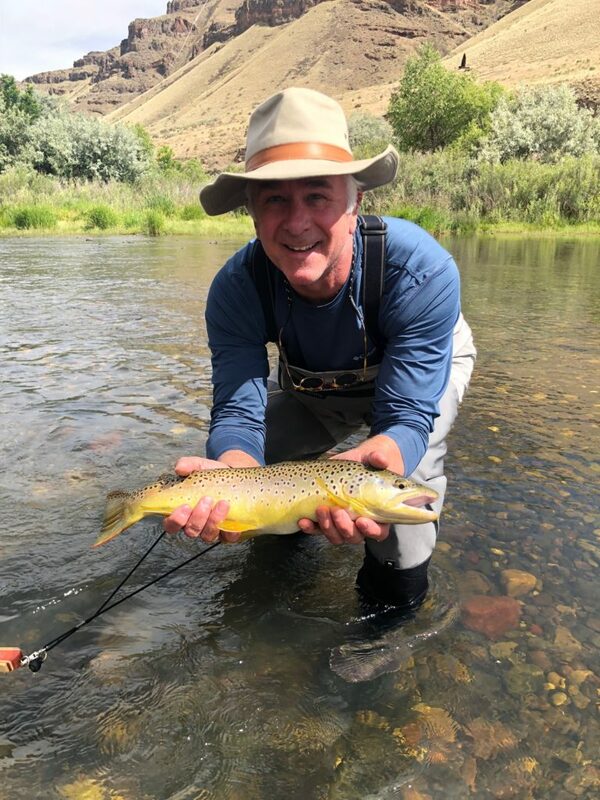 As a family the O’Neill’s love fly fishing and have experienced many adventures floating down the Snake River in Idaho, riding horseback and camping out near wilderness lakes and mountain streams, and experiencing the majesty of California’s Sierra’s. 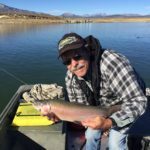 Their daughter’s husband and son’s fiancee learned to fly fish in the Sierras last year while on a family vacation extending the O’Neill family fly fishing tradition. Three years ago Richard retired from a life long career in advertising on his 65th birthday. Fly fishing will continue to take Richard, Regina and their family on wonderful adventures. I am married with four children (two girls and two boys), that my wife Lianca and I have raised in Newbury Park. Our oldest daughter is 26 and is a Metallurgical Engineer. Our youngest son is graduating from NPHS next month and he is planning on becoming a professional bicycle rider for Giant Bikes. 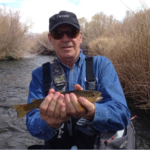 My favorite fishing areas include Convict Lake (creek), Rock Creek Lake, and the Owens river. Up to this point, I have only caught fish using spin casting techniques. Although I have wanted to learn to fly fish for many years, it wasn’t until last weekend that I finally finished a 3-day fly fishing class taught by Earl Arnold and Randy Weir at the Thousand Oaks Adult School. They told the class about the fly fishing clubs in the area including the Sespe Fly Fishers and the Conejo Valley Fly Fishers. I have yet to catch a trout using a fly. I have about a year until retirement and I am planning to do a lot of fishing in the near future. I want to join your club to learn as much as I can about this great sport and make new friends that love to fish. The attached photo(s) are a couple of years old but that is all I have at the moment. Hopefully I will be sending you a picture of my first fly-caught trout in the very near future! 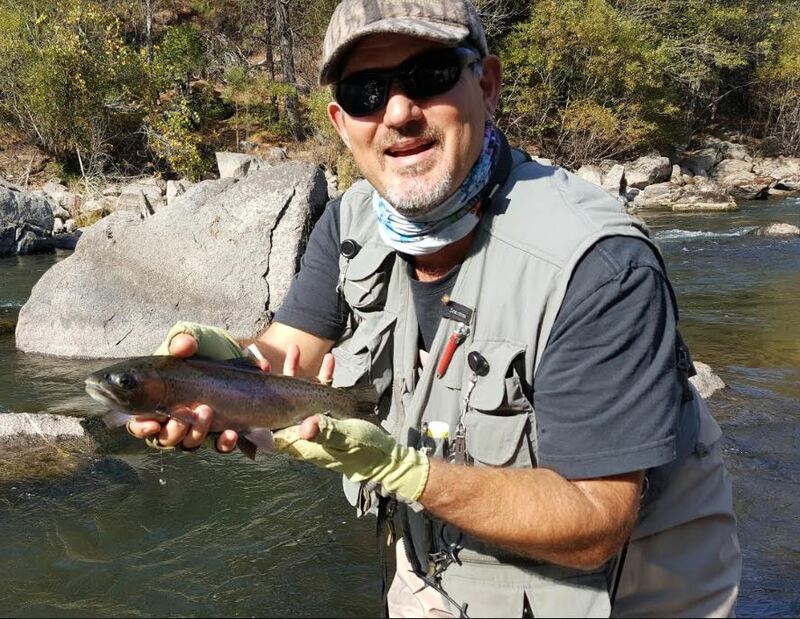 JOE CALLEWAERT – with a nice rainbow on Crowley. Scott Olson and Mike Bereny have been friends / fishing friends of mine for about 25 years. I am 67 years old. Married for 43 years to my wife Lynn. I live in Winnetka, Ca. 2 kids …both live in the San Francisco area….we have 3 grand children and spend about a week a month up there. 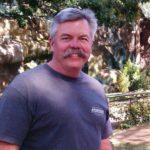 I retired about 6 years ago and was a project manager for a large Mechanical contractor. Hobbies….Fishing, golf, travel in RV and wood working.